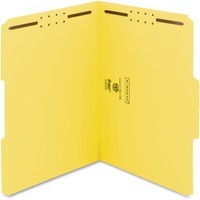 Smead WaterShed CutLess Fastener Folders SMD12942 $39.26 Protect your documents with office friendly fastener folders that resist liquid spills, dirt and finger oil while significantly reducing paper cuts. Two fasteners allow you to subdivide papers within the folder while holding papers securely inside. Reinforced tab provides durability at the point of greatest wear. Tabs are 13 cut in assorted positions for easy access. Use color to categorize different types of folders in one system. WaterShedCutLess Fastener Folders hold letter size documents and feature straight cut tabs and 11 point stock.